Making all the preparations for everything to be perfect for the 2018-2019 school year can be exciting, yet it brings some anxiety as well. Each year we have a new set of students, a new set of goals for them, and we seem to hit the ground running. It’s important to spend time getting to know each other, getting to know each student’s needs, figuring out your curriculum, and then how you’ll go about differentiating for each student and their unique needs. This year, many of our project schools have adopted the theme of student-led instruction or inquiry-based learning. It can be easy to get in the habit of guiding kids through instruction instead of trying to learn what they can do on their own and watching to see what kids can do when the going gets tough. Kids in the 21st century live in a very entitled world where instant gratification is at their fingertips, whether it’s on their device or from their parents of just the nature of the fast-paced life that we live. As teachers, we sometimes need reminders that students can do a lot of things without us necessarily guiding them. We want our kids in school to learn that failure is ok. Failure is not the end of the road, but you can figure out ways to work your way out of or around it. After all, that’s what life is all about! 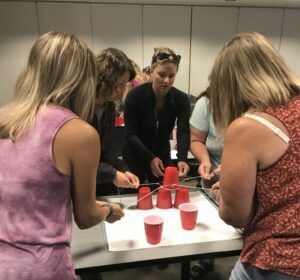 Tower of Cups is a fun activity that can help your students start to understand the idea of perseverance, allow you to observe how they face challenges, and promote unity and collaboration in your classroom. The challenge is designed to help people work together and realize that one opinion might not be the best opinion. It encourages the same kind of flexible thinking and listening to others’ ideas that we’re looking for our students to develop in the classroom. Goal: Build a tower of cups by working together. 5-7 plastic cups of equal size (no handles). We like to use Solo cups because they’re fatter on the top and skinnier on the bottom, which makes the task a little bit harder. 1 rubber band that must fit around the plastic cup. Be selective with the elasticity of your rubber band! Find the thickest rubber band that will still stretch around the largest part of your cups. 5 pieces of string, cut to approximately 24” long. They could be yarn, twine, whatever you have on hand. 1 pieces of paper approximately 2’ by 2’, big enough for the cups to sit on and for students to be able to do their work. The ideal number of students in a group for this activity is 5. If you end up with a group of 4, one person will end up doing double duty, and if you end up with 6 in a group, one person could serve as a mediator/overseer for the group. Tie the strings to the rubber band, evenly spaced apart around the rubber band so you have what looks like a 5-legged octopus. Make one octopus for every group. Gather each group of students around their piece of paper, and scatter the cups face down on the paper in the middle so that all 5 cups have a space of their own. 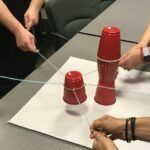 Teams can work together but may not touch the cup with their hands or any part of their bodies (even if the cup tips over!). Groups must only use the rubber band octopus to pick up the cups and place them on top of each other. 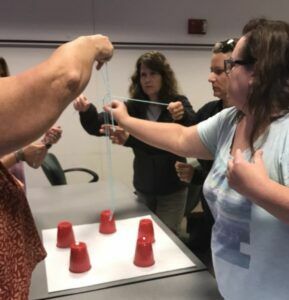 It is up to each group to figure out how to control the octopus by pulling and releasing the string on the rubber band to get it around the cup. Play several rounds, changing the assigned tower configuration or other rules as you go. Start with having students build a traditional pyramid, with 3 on the bottom, 2 in the middle, and then 1 on top. 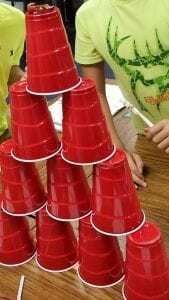 Have students build a single tower of cups. Start with the cups all facing up. Start with some cups facing up and some facing down. Increase the number of cups (try 10!). Make it more challenging by telling students they are not allowed to have their hands cross over the paper in any way. How did you complete the task? Was there a leader in your group? How was the leader chosen? Did your leader step up as a leader or were they elected? What skills did you use to make this activity successful? What needed to be done to complete the task? What was a struggle the group had and what was something they were successful with? What does it mean to work together in a group with others? Why is it important to work together as a team? In our professional development at Westwood Community Schools at the University of Michigan in Dearborn, we related this to math instruction. Because of the odd number of participants, one of our groups had six people in it. That 6th person was giving verbal instructions about how to accomplish the task, without much success. The rest of the group were the ones with their hands on the project, actually pulling the strings and manipulating the cups, so why was he asking the group to do it a certain way when he wasn’t actually doing it? In our debrief, we talked a lot about that lesson as it pertains to math instruction. When you’re teaching math, often you can tell kids step-by-step how to do something, but until they work together with someone, share ideas, and come up with their own strategies. Perhaps the strategy isn’t even something you came up with! At the end of the day, kids take more ownership of their ideas when they have formed. The other topic we talked quite a bit about was perseverance. When the tower flips over, or when a cup flips completely upside down, or when a cup tips onto its side – how will they handle the challenge? 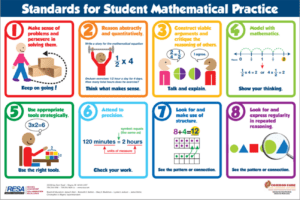 The 8 Standards for Mathematical Practice (the process standards that students go through while applying mathematical thinking) are essential for helping students become independent thinkers and persevere when they face challenges. 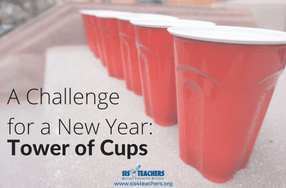 Of course, we had a lot of fun seeing who would complete the challenge the fastest, but the more important thing I wanted the teachers to walk away with was a vision for their own students stacking these cups. If you tell your students how to stack the cup perfectly, they’re not going to actually be able to do it on their own. Many times, in math instruction, we do model something with the child next to us and so we feel that they have the understanding because we feel like we’re explaining it the right way. The child nods and smiles, but then we come back later or the next day and the child has no memory of what we talked about. That’s because we’re owning all of the instruction. Our theme for this new school year is transferring as much ownership as possible to the students. We challenge you to see how many opportunities you can provide for your students to go through the 8 Mathematical Practices without you assisting. Let them fail and observe how they handle it. Be there to guide them as a facilitator, instead of a giver of information. Challenge your students to work their way through the things they’re doing with their own ideas. Get them to construct valid arguments. Help them learn to critique the ideas of others. Give them tools and strategies to model using manipulatives. Be sure to infuse your classroom with lots of variety using CPA (concrete, pictorial and abstract) ways of thinking.